Muslim pilgrims arrive to throw pebbles at pillars during the "Jamarat" ritual, the stoning of Satan, in Mina near the holy city of Mecca. Pilgrims pelt pillars symbolizing the devil with pebbles to show their defiance on the third day of the hajj as Muslims worldwide mark the Eid al-Adha or the Feast of the Sacrifice, marking the end of the hajj pilgrimage to Mecca. A stampede during one of the last rituals of the Hajj — the annual Islamic pilgrimage to Mecca — has killed more than 700 people and injured nearly 900 others in Saudi Arabia. The stampede occurred Thursday morning during the ritual known as “stoning the devil” in a tent city in Mina, about two miles from the holy site in Mecca, Islam’s holiest city. While safety experts said that it was too early to identify the exact cause of the latest incident, it is likely to raise questions about the Saudi authorities’ handling of the huge crowds of devout Muslims who visit Mecca every year. The pilgrimage – known as the hajj – is considered the duty of all observant Muslims. 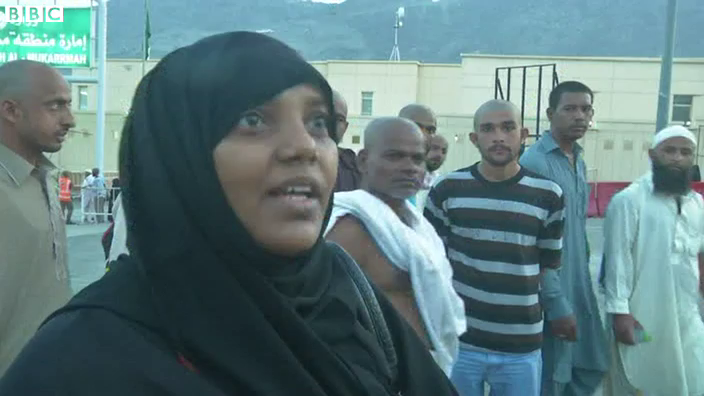 The tragedy was the worst to befall the pilgrimage since July 1990, when 1,426 pilgrims perished in an overcrowded pedestrian tunnel leading to holy sites near Mecca and the ninth in a string of such incidents since then. Both stampedes occurred on Eid al-Adha (Feast of the Sacrifice), Islam’s most important feast and the day of the stoning ritual. Over the last 25 years, such incidents have claimed the lives of more than 3,000 pilgrims. Prince Mohammed bin Nayef, Saudi Arabia’s crown prince who chairs the Saudi hajj committee, ordered an investigation during a meeting with senior officials responsible for the pilgrimage in Mina, where the stampede took place, Saudi Press Agency reported. 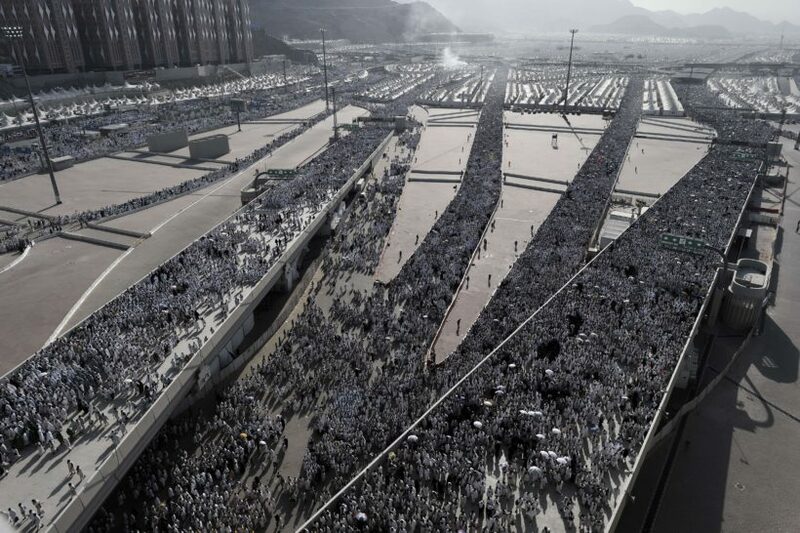 According to the Saudi civil defense directorate, the crowd became dangerously congested at the intersection of two streets, known as 204 and 223, as the faithful were making way towards the Jamarat Bridge, which overlooks the stone columns where pebbles are cast. Amateur video shared on social media showed corpses lying amid crushed wheelchairs used by some disabled pilgrims. The tragedy comes despite the Saudi authorities installing sophisticated crowd analytics software which is linked to central control room where officials can analyse and predict where pinch-points and surges are likely to take place. She said she could not comment on why the technology had not been rolled out more extensively, and added that it was still too early to determine the exact cause of the accident. The 2006 incident prompted a major safety overhaul, with the last nine years having been relatively trouble-free. Less than two weeks ago, a giant construction crane came crashing down on the Grand Mosque in Mecca, the focal point of the hajj. More than 100 people were killed. Each year pilgrims pay hundreds of thousands of dollars to go on the religious trip, with people spending between $6,000-7,500 for a typical pilgrimage. Pro-Russian rebels in east Ukraine have ordered UN agencies working in the separatist stronghold of Lugansk to leave the area by Saturday, UN aid chief Stephen O’Brien said. Several international non-governmental organizations have separately been told to leave Lugansk by Saturday, Mr. O’Brien said in a statement Thursday. Pro-Russian leaders said earlier they had banned 10 Western relief groups including Doctors Without Borders (MSF) for “grave violations” of laws. The Lugansk guerrillas have accused MSF of “illegally storing psychotropic medication” that lacked proper registration in either Russia or Ukraine. MSF strongly denies the allegations. O’Brien, the UN under-secretary-general for humanitarian affairs and emergency relief coordinator, said some 16,000 tons of humanitarian aid had not been delivered and that local hospitals could not perform surgery because they lack anesthesia. 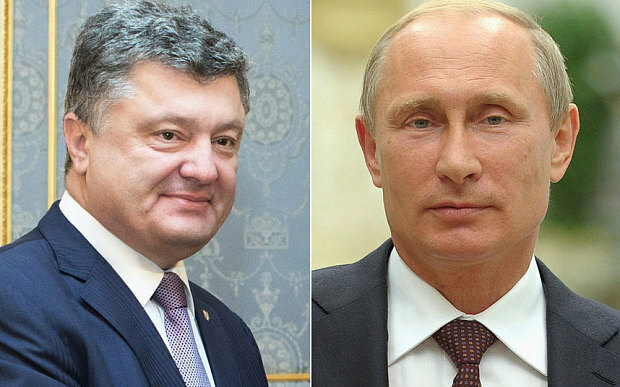 The move came ahead of an October 2 meeting in Paris of Russian President Vladimir Putin with his Ukrainian counterpart Petro Poroshenko to try to advance peace prospects. The United Nations estimates that the 17-month conflict in east Ukraine has claimed the lives of nearly 8,000 people and injured almost 18,000 — most of them civilians. BERLIN – German officials said Friday that nearly a third of all asylum seekers arriving in the country appear to be falsely claiming to be Syrian, even as Interior Minister Thomas de Maizière called on European nations to take radical new steps to curb the region’s refugee crisis. So far this year, Germany has received 527,000 asylum seekers – more than any other nation in Europe. Tobias Plate, an interior ministry spokesman, acknowledged estimates Friday that roughly 30 percent of the asylum seekers are those hailing from other countries but claiming to be Syrian. Given the civil war raging in Syria, roughly 87 percent of Syrians are successfully winning asylum in Germany. Plate said that rather than a “concrete statistic,” the number was an estimate based on the perceptions of authorities on the ground, including the German Federal Police, the Federal Office for Migration and Refugees, and Frontex, Europe’s border agency. “It is an indication,” he said during a news conference in Berlin, of how hard it is to know the true nationalities of asylum seekers, many of whom are arriving without passports. In an interview with The Washington Post on Friday, de Maizière – a longtime ally of Chancellor Angela Merkel and one of the key figures dealing with the refugee crisis in Germany – said Europe needed to enact sweeping changes to its refugee system. He added that German attempts to aid refugees had been misinterpreted by migrants in far-flung nations such as Afghanistan as a green light to come to Europe. That, he said, needs to change. Germany is moving to slash cash benefits for asylum seekers, instead offering in-kind assistance such as food. De Maizière also said it would take “years” before refugees currently in Germany would be able to bring close family members into the country. b) Saudi King Salman has ordered “a revision” of how the Hajj is organized in the wake of the tragedy, which is the ninth major incident of its kind in Mecca in the past 25 years. While Saudi officials have tried to pin the blame on the pilgrims themselves, saying that they failed to follow strict timetables as to when and where to walk, witnesses say it was caused by poor crowd management and unexpected road closures. The Saudi government has expanded the numbers of pilgrims in recent decades, from fewer than 100,000 in 1950 to around three million today, making religious tourism one of the kingdom’s largest industries. But critics say the expansion has focused more on providing expensive hotels and shopping malls that benefit only the wealthiest visitors, rather than on ensuring safety procedures that benefit all. What responsibility do you think the Saudi monarchy should take for so many tragic incidents? b) Why did the separatists order the humanitarian groups to leave? 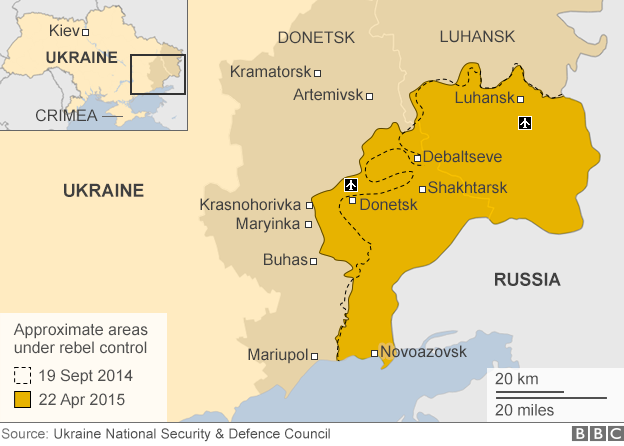 c) What problems will this pose for Ukrainian civilians living in those areas? b) What percent of migrants arriving in Germany are not Syrian refugees? c) What is the cause of this problem? d) What is the German government doing to address this problem and what actions do they want EU member states to take? (see also “Background” below the questions. Germany’s solution, according to De Maizière: “We have to find a common European solution. In the end, we [all EU countries] would need really nearly to have the same social benefits.” To reduce the strain on Germany, de Maizière called for European Union countries to adopt minimum and maximum benefit standards so that no one country becomes an outsized draw. e) Do you think that the other EU countries should fall in line with whatever amount of benefits Germany wants to give asylum seekers? How should they solve the problem of all of the other migrants entering Europe? CHALLENGE: Read the commentary “Germany: Migrants In, Germans Out.” What is your reaction to the German government’s actions? This is the deadliest incident to occur during the pilgrimage in 25 years. Iran has declared three days of national mourning. Protesters marched in Tehran shouting slogans against Saudi Arabia’s ruling al-Saud family. Alaeddin Boroujerdi, head of an Iranian parliamentary committee for national security, called on other Islamic countries to lodge protests with the Saudis. Ukraine gained independence after the collapse of the Soviet Union in 1991 and has since veered between seeking closer integration with Western Europe and reconciliation with Russia, which supplies most of the country’s energy. While Ukraine and Russia share common historical origins, the west of the country has closer ties with its European neighbors, particularly Poland, and Ukrainian nationalist sentiment is strongest there. 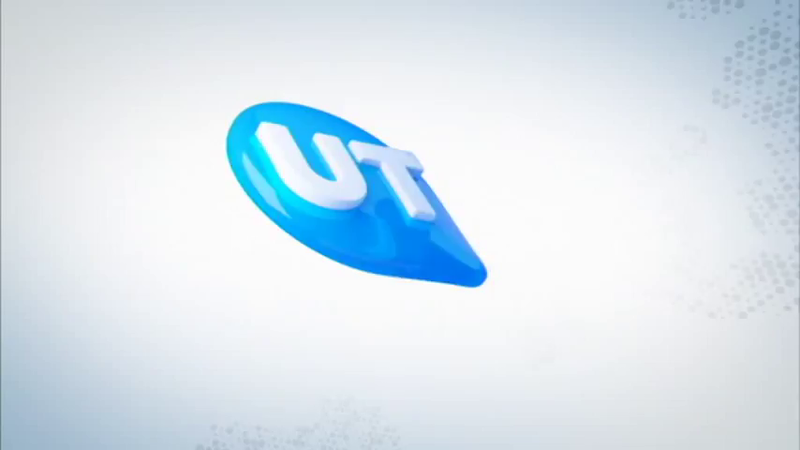 A significant minority of the population of Ukraine use Russian as their first language, particularly in the industrialized east. In Crimea, an autonomous republic on the Black Sea that was part of Russia until 1954, ethnic Russians make up about 60% of the population. To date, its welcoming policies and lucrative benefits have made Germany by far the single biggest destination for refugees coming to Europe, a situation some European leaders have said Berlin brought on itself by adopting such a generous stance. To reduce the strain on Germany, de Maizière called for European Union countries to adopt minimum and maximum benefit standards so that no one country becomes an outsized draw. Such a plan, however, is certain to face resistance in nations such as Hungary and Slovakia that have taken a hard line against refugees. On Thursday, Germany’s Interior Minister Thomas de Maizière made headlines by suggesting that the crisis had gotten “out of control” after Merkel’s decision this month to allow in tens of thousands of refugees who had been barred by Hungary from going deeper into Europe. 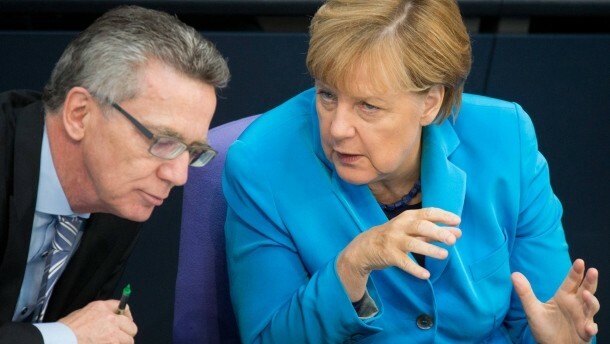 Leading German media outlets, including Spiegel Online and Frankfurter Allgemeine Zeitung, interpreted the statement as de Maizière indirectly criticizing Merkel’s move. On Friday, de Maizière, a former top negotiator on German reunification, also reiterated a plan he fielded earlier this month that goes beyond the one approved this week to redistribute 120,000 asylum seekers arriving in Greece to nations in the EU (European Union). De Maizière called for a “generous” new quota for the total number of refugees allowed into Europe, above which European nations would simply send refugees to secure camps in the Middle East and Africa. He suggested that 500,000 to 1 million refugees could be safely airlifted to Europe directly from conflict zones. He said French officials had warmed to his idea.